In order to provide the you the tools to continue the fight we gave you two ways to look up what's on the books. Just click on either way to know more. By bill is the most complete, since some bills are not sponsored by an organization. Remember we are always updating our site and may not be complete. If you do not see a bill you are following, please contact us to help us complete our information. 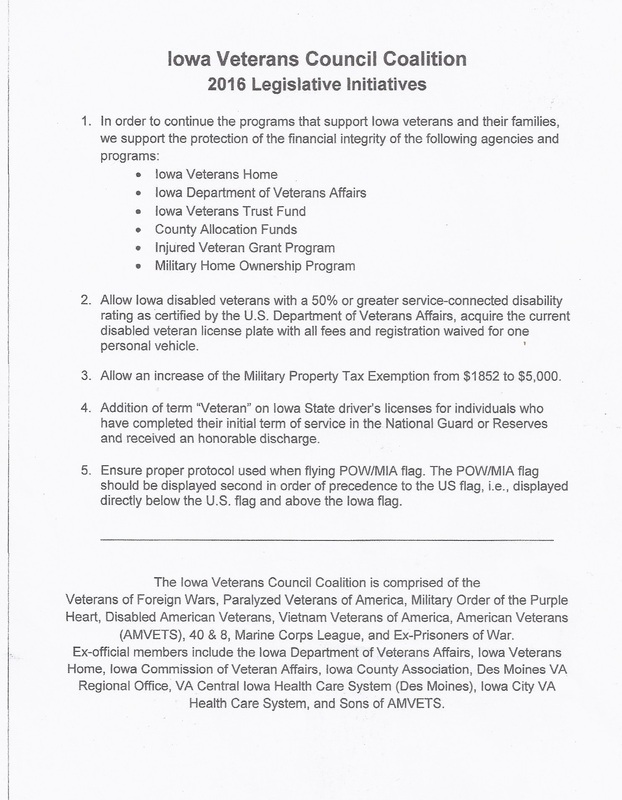 The Iowa Veterans Council Coalition is comprised of the Veterans of Foreign Wars, Paralyzed Veterans of America, Military Order of the Purple Heart, Disabled American Veterans, Vietnam Veterans of America, American Veterans (AMVETS) 40 & 8, Marine Corps League, and Ex-Prisoners of War. Together these organization push initiatives through the Iowa State Senate and House to improve Veterans in Iowa and making this State a Veteran Friendly State.